Disney World has a few different dessert parties available, and the newest of those is the Frozen Ever After Dessert Party at Epcot. The parties aren't cheap so here's some info to help you see what's included and learn how it compares to the other dessert parties. 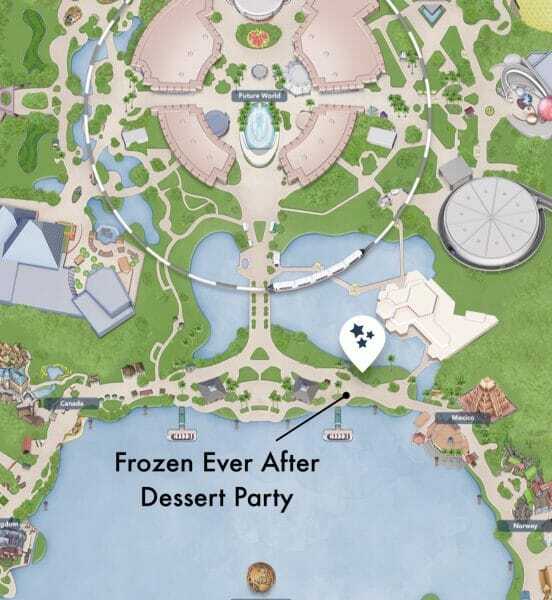 What is the Frozen Ever After Dessert Party? 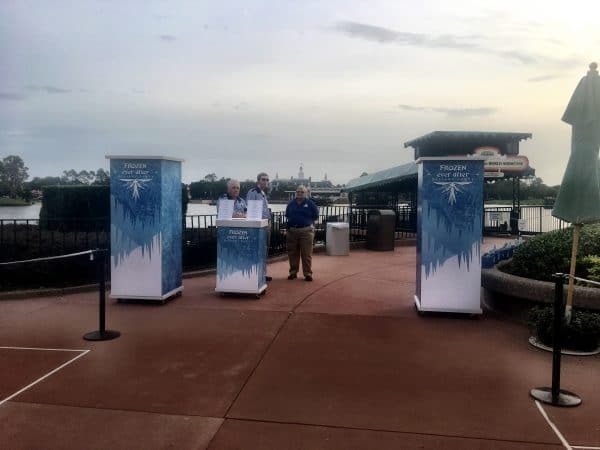 While this party doesn’t offer a better viewing location than you could find on your own, it does have adorable Frozen theming, a nice variety of delicious desserts and drinks, and a private ride on Frozen Ever After to end the night without worrying about lines or FastPass+. This party is a fantastic choice, particularly for Frozen lovers. The Frozen Ever After Dessert Party is an event that takes place a few nights each week at Epcot, starting about an hour before IllumiNations. Attendees get to consume Frozen-themed desserts and drinks, view IllumiNations, and ride Frozen Ever After. Admission to attend is $79 for people age 10+ and $47 for kids age 3-9. Reservations can be made online or by calling 407-WDW-DINE. The party takes place on the Showcase Plaza (the path that separates Future World and the World Showcase), near the Friendship Boat launch closest to Mexico. Your Frozen Ever After Dessert Party reservation will suggest that you check in an hour before IllumiNations. You'll get an armband and then be told where to sit at your pre-assigned table. Once you've been taken to your seat, you can start to eat the delicious desserts and grab a drink or two. After eating and drinking your weight in desserts, guests are given special snowflake glasses to watch IllumiNations. Once IllumiNations is over, party attendees are lead to Frozen Ever After (feels like a salmon swimming upstream as the crowds head out of the park in the opposite direction). So nice to not have to worry about lines or snagging a FastPass+! Although the reservation says you can check in an hour before IllumiNations, you can actually check in much earlier than that (we got our armband at 6:30), and then they will allow you to enter about 75 minutes before IllumiNations begins. Tables are pre-assigned based on when you made the party reservation and the number of people in your party. People who book way ahead of time and have a group of 4 or 5 people have a much better chance of getting a table along the water. There's almost always a bit of a line for alcoholic drinks, so be sure to get multiple drinks while you're there to save time. Just always ask for 2 of whatever you want to drink. Bartenders accept tips. 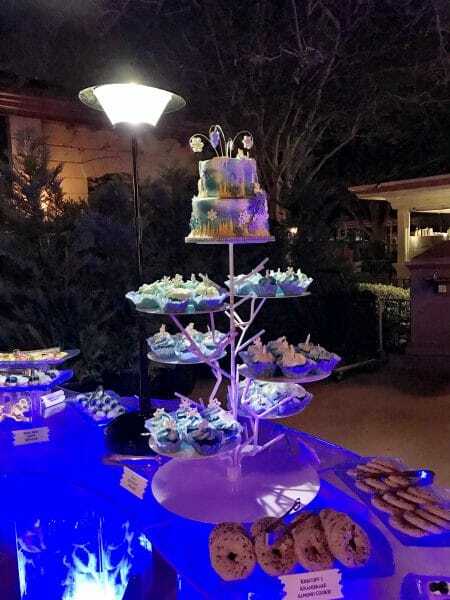 There are several dessert parties at Disney World, and while they are all much more worth it than they used to be, some are better than others. If you're looking for a party with the best views, I'd choose the Plaza Garden option at Magic Kingdom or the Star Wars Dessert Party at Hollywood Studios. If you're looking for the best bang for the buck for desserts and drinks, I'd choose the Frozen Dessert Party at Epcot or Star Wars Dessert Party at Hollywood Studios (both have delicious desserts and include alcohol). 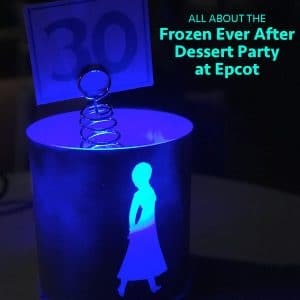 If you happen to have a Frozen fan and really want that ride on Frozen Ever After ride without having to worry about a FastPass+ or being part of the rush of people at park opening, then the Frozen Dessert Party at Epcot will be perfect for you. Are any of these dessert parties Included on the dining plan? Do I have to be going to Epcot that day to attend the Frozen Party? 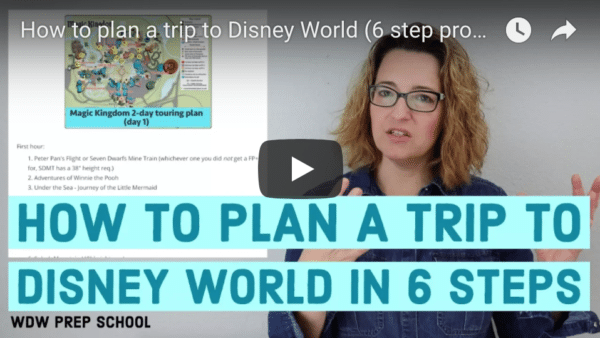 Yes, you must have a park ticket for Epcot to be able to attend. So what time did Illuminations start for the party that you went to? It almost always starts at 9 p.m. Does anyone know how far out these are scheduled? We tried to book while doing dining, none scheduled during our time, tried to book again when fastpasses became available,none scheduled, called that day and they didn’t know when the next one would be. Week of trip they email us saying try this, we log on immediatly and the two scheduled during our trip were booked. Kinda feel screwed a little. Did we literally have to check call every day up until the day we leave. Hi Shannon- What is the usual schedule for the party (e.g., what nights is it usually offered)? During busy periods, is it offered every night, including the EMH evenings? 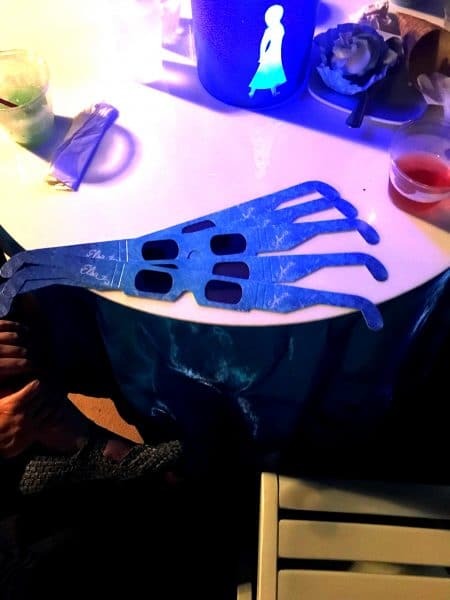 Hi Shannon – we were just at the Frozen dessert party this past week. We had a great view sitting from our table. And we LOVED the special snowflake glasses and made sure to bring ours home to give to the grandkids to watch the fireworks at home (even though it will be summer then!). Here’s our news that may interest some of your readers – we are GLUTEN FREE. We had that on our reservation. We walked in and looked at all of the delicious looking desserts, but it looked like all we could have was fruit (although the fruit was very good). We mentioned it to one of the cast members and she got the chef. She pulled out the ingredients list for everything there and agreed that we were pretty much limited to the Nitro popcorn (very good). But, she asked for our table number and said she’d come up with something. About 5 minutes later my wife and I each got a large bag filled with gluten free goodies – a large chocolate chip cookie, a large brownie, a red velvet cake cup, some chocolate putting type thing, almond cookies and a couple of different options of chocolate bars – along with some gluten free bread that could be broken up to use in the cheese fondue. Needless to say we couldn’t eat it all and brought much of it back to our resort. As a side note, we enjoyed being able to have a cocktail and a glass of wine. We weren’t crowded at all and I was able to go up at ease to the bar. 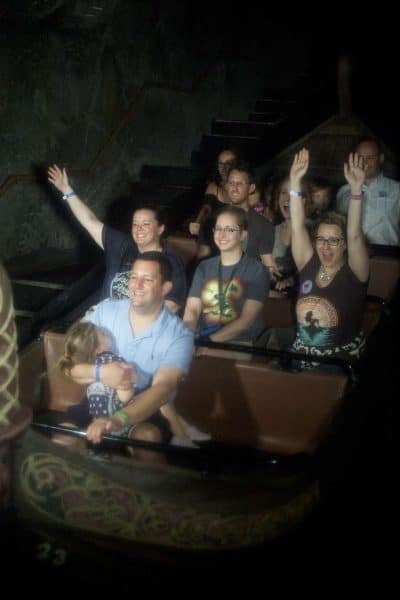 This was topped off by getting to go to Frozen Ever After since we weren’t able to score a Fastpass+, and we didn’t want to miss it. What a treat to just walk right on, and then have an empty park to walk through on our way out afterwards. Thanks for info on Frozen dessert party. We loved the Star Wars Dessert Party last month – just a heads up – the price increased Oct 1. Beginning October 1, the price will change to $79.00 per adult (age 10 and over) and $45.00 for child (age 3 to 9); tax and gratuity are included. You may want to update your infographic! Thanks! Thanks for the heads up! Got it updated. Did you try the Nitro popcorn? We just enjoyed the Frozen Dessert Party last night and we loved it. The food was delicious, the drinks were good, and we especially enjoyed the snowflake glasses. They added so much fun to the fireworks. In our opinion it was well work the money. How crowded is the viewing area? 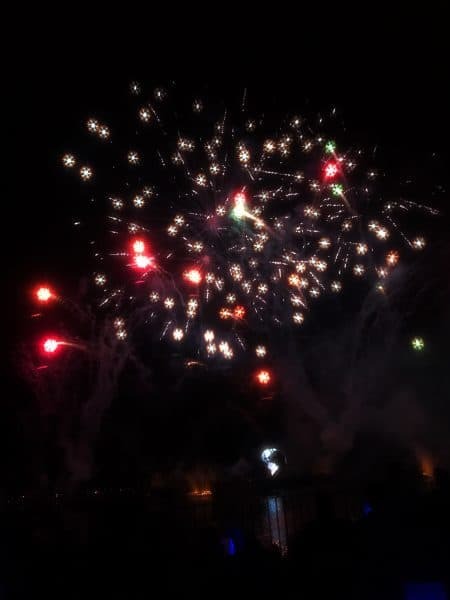 Last trip we secured FP’s for Illuminations. An hour before the show the line was so long we blew it off, walked towards Canada and grabbed a comfortable, non crowded spot on the rail. Do you stay at your table during Illuminations or is there a separate viewing area where you stand for the show? You can stay at your table for the show which is nice because then you know you’re guaranteed a seat while you wait and watch.